Early afternoon I saw my dad danced this popular "Oppa Gangnam Style". Hilarious dance steps by dad but really contagious. It was a great family day bonding, not to mention the abused replay button of this song on you tube . I didn't really care for that song the first time I heard it but after checking it on google, I found out that this song is actually poking fun at those kinds of people who are trying so hard to be something that they're not. My reaction was "wow", I think I'm loving this epic song. I got really inspired for its catchy beat and Psy's humorous dance moves in the music video. Here are my gangnam style poses below, what do you think? hilarious enough? haha! Haha, what fun photos! Great, now that's gonna be stuck in my head all day. Your shorts and bag are really cute too! Hello dear! i love the gangnamstyle!it's great! I like your blog and I´m following you now. Hope you will follow me too! I love your shorts and the bag. I love your post, you look stunning! Thanks for the comments, but your blog is also very nice, just have more a reader, if you want to you can be even a reader of our Bloges. ahah! :D lovely pics! would you like to follow each other? let me know dear! Cool outfit! Love the bag. the name of this post is amazing! I like this outfit, looks very comfortable. Hello! i love your blog! im following you now on gfc and bloglovin! if yo like my vlog, follow me back please! and if you have facebook page, if you like we can follow each other. I'm your 337 follower, if you like my blog too I'm waiting for you! Such a cute outfit! you look gorgeous sweety! love the sweater! Omg the outfit is really cute. Love your color of the top and the prints on the shorts! :D Plus you look really cute in these pictures! I'm so sorry! I didn't recognize.. I'm already following you too! Great post ;-) Love your outfit and I so love this song. P.s. You're blog is so cute. Fabulous design! Adorable outfit! Loving the hat with the blouse. 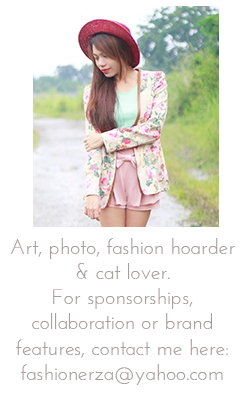 On a completely non-clothes-related comment, I LOVE the styling of your blog! It's cute! Really lovely and sweet outfit. Amazing shorts. I love your outfit! The burgundy hat, sweater and bag are awesome!! Your floral shorts is gorgeous as well!! great outfit!!! I love it so much!! What a beautiful and cute blog you have. I adore it I cam to follow you back, thanks for commenting on my posts I will be checking your updates. awh, such cute items! i love the dress here. Cute dress! I will check out that store !! Loving that yellow shirt & Bag! Following you back Darlin! I have finally gotten myself to your Blog! Haha such a fun post. I totally love the layout!!! Would you like to follow eachother? Such a cute outfit! those shorts are adorable!